Il s’agit d’une maison historique de plain-pied de style Cape Cod, avec des finitions plus anciennes, y compris la cuisine d’origine. C’est un très bon emplacement, mais un vieux et le prix reflète l’état de la maison. Cette maison comporte deux structures. La première structure est une suite parentale de style lune de miel avec une chambre à coucher, une salle de bain et un lit queen size. La deuxième structure est une maison de deux chambres deux salles de bain avec une cuisine ouverte, salle à manger et salon. La cuisine entièrement équipée a une gamme; lave-vaisselle et micro-ondes ouverts sur le salon et la salle à manger. La première chambre a une chambre king-size, son propre bureau, une télévision et une salle de bains. La deuxième chambre a des lits jumeaux, sa propre télévision et sa propre salle de bain. Parmi les autres caractéristiques de cette charmante demeure, citons le Wi-Fi, des livres et des films pour nos hôtes, des chaises de plage et un barbecue. Une propriété unique en son genre: faites griller tout en profitant de la vue et du son des vagues depuis votre pont avant. Si vous recherchez une maison à la semaine, une vue directe sur le golfe, un charme historique et des finitions plus anciennes, cette maison est faite pour vous! n et maintenus, mais les clients sont encouragés à définir leurs attentes en fonction de l'expérience de vacances souhaitée. Promenez-vous sur la plage pour profiter des plages de sable blanc et des magnifiques couchers de soleil. Descendez à Tween Waters pour vous détendre au bord de la piscine, écoutez un groupe, louez un bateau, faites du kayak ou profitez de l’un de leurs délicieux restaurants. * Tween Waters peut facturer des frais supplémentaires pour l’utilisation de ses installations. Serviettes de plage fournies. Vous trouverez un kit de démarrage contenant du liquide vaisselle, un détergent pour lave-vaisselle, un détergent à lessive, un rouleau de papier essuie-tout et une petite barre de savon par douche, un rouleau de papier hygiénique par salle de bain et un sac par poubelle réceptacle. Nous facturons pas de frais supplémentaires et sont de véritables habitants de l'île (nous vivons sur les îles), appartenant à une île et exploités. Lovely spot - perfect house for us. The cottage was great - super view to the Gulf. Great front deck for coffee, breakfast and dinner with a good gas grill there as well. The folks at Kingfisher were very helpful with the little questions we had. Only issue we had was too little (1bps) throughput on the internet. May need to investigate the line between the street and the house to clear this up. The area around us was great with good spots to eat and shop and the beach out front was like having the coast to yourself. The location is perfect. 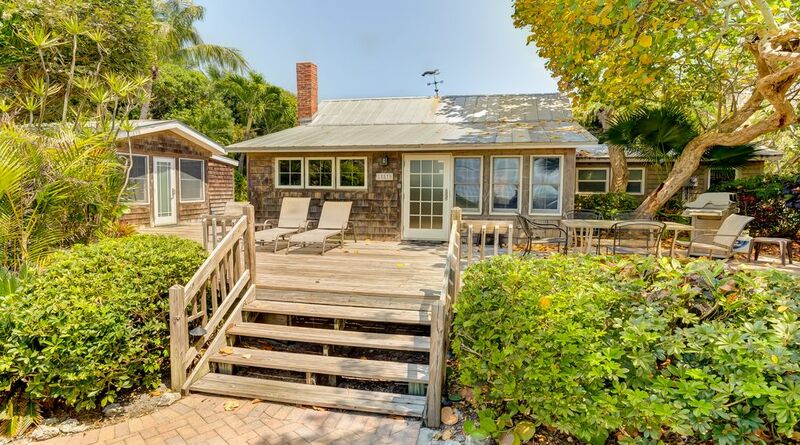 Easy walk across the street to the beach and close to Captiva restaurants and shops. Unfortunately the furniture has not been updated in what appears to be many years. I had read a review prior to booking about the kitchen and agree it is not necessarily a kitchen that a cook would love but it certainly had everything we needed. The couches are old with existing stains and uncomfortable. One should not book expecting a proper rest as the beds are extremely uncomfortable and consider bringing your own pillows. We slept in the detached room and the shower grout was clearly original, dirty. The property is called “Charm” which fits the exterior and not the interior. This not a property I can recommend with the exception of beach access. We are loyal VRBO customers and this is the first time we felt the property was not as advertised. Thank you for the review. We feel it is mostly fair and accurate. We would agree that the couch is dated and in need of replacement. Beds can be tricky as everyone has a bit of a different preference and this is the first complaint on them but, I suspect, they may be older like the rest of the furniture so we will reach out to the owner in the hopes of updating them. We will be delivering new pillows for all the beds this week. We are happy you found the location perfect. Thank you. I will update this post as we work with the owner on updating the beds and couch. Lovely little cottage with beach access, bring your own everything. My family is from Florida, we grew up in Florida, as a group and individually we prefer a rustic beach house compared to the newer ostentatious houses being constructed. This place was perfect for that. Gorgeous views from the front deck, great beach access, the rooms were comfortable, and we enjoyed our thanksgiving here. We were a family of 6 Adults, and 2 kids, This would probably make better accommodations for less people, although we really did enjoy it, I would definitely come back. I would enjoy it more if the kitchen was more usable, and they provided some basic supplies. Cons Supplies: I didn't notice in the listing that it said ONE trash bag is provided. Good thing my sister did, same with toilet paper in the bathrooms, ONE roll provided. If we're spending 3K for a week rental, is an extra $20 in supplies being provided really cutting into your costs? Cons Kitchen: the kitchen is small and dated, with the worlds smallest dishwasher. We were provided with 2 dish soap tabs, my sister brought extras, but hers didn't seem to work in the machine as well, and would often result in crusty dishes, which were also in the cabinet from previous guests with the same issue. It was annoying to have to rerun the washer.. The stove has a knob that has been snapped off, so one of the burners is unusable, it's very old, bent up, and crusty. Cons Washer/Dryer: It's a very small washer and dryer. It worked and everything was fine. I don't think the lint filter in the dryer had been cleaned in recent years and looked like a fire hazard about to happen, it's in a weird place in the back of the dryer. One reviewer said they could only wash 2 towels at a time, and I believe that, however they were probably beach towels. Attached room with bathroom: this was the room my husband and I stayed in. It was strange having the AC unit in the bathroom, but it worked great. We had to call because the toilet was flooding out the bottom where it connects to the ground and the shower was backing up. Someone came and fixed it. Slight inconvenience. then had to wash all the toilet water towels in the tiny washer... so again annoying. Drawers on the dresser are falling apart. Overall it was a great stay, we loved the location, even with it needing updating, if those things really bother you, and you need luxury accommodations this isn't for you. Incredibly slow WiFi at 1mbps, yes ONE. My husband had some work to do from here and wasn't able to. The location could not be better. Right ac cross the street from your own beautiful beach. Take a walk along the beach to Mucky Duck for a drink. Kitchen a little dated but more than functional, and who wants to sit in the kitchen when you have a terrific deck and the ocean feet away? Will be back. Thank you so much for the wonderful review! We are happy you had a nice stay and hope to see you soon! Great little getaway! Great location and short walk to beach!! Home is aged and shows wear and teae but does have what you need for a vacation and it adds to the character of a beach cottage! Our family of 5 had plenty of space to rest and hang out together. The sounds of the ocean and peaceful atmosphere of the home was very relaxing. Shelling was amazing - we took home plenty of souvenirs and walking right across the street to the beach was so convenient. Yes, the house is a bit dated inside, but it's really cute and homey! Don't miss the shell museum (surprisingly interesting), segway tour was fun on a cloudy day, we rented bikes, which was also a lot of fun. Had the weather been a tad bit warmer, we would have enjoyed the ocean more, but we certainly loved the sunshine when we had it. We use VRBO often and my husband said the pictures really didn't do it justice in terms of proximity to the ocean and beauty of the trees on the property. Thank you so much for a lovely stay! Captiva charme est situé sur Captiva Dr et est au cœur de Captiva Village. A quelques pas des boutiques, des marinas et restaurants. La plage est directement en face une rue calme. Regarder les couchers de soleil depuis votre terrasse avant.